It Happened One Night Spooks Me! Guess I'm safe for assuming that no one else refers to It Happened One Night as the Dawn Of The Dead of romantic comedies, and yet for me, it's every bit as unsettling as that zombie-fest of 1979. I might not even have watched but for Netflix streaming IHON in HD this month, thus chance to look again at latest tweaks Sony/Columbia's applied to long-problematic surviving elements. The feel-good Frank Capra classic never left me feeling so, for here's Depression (that D in caps throughout) spread like black tar down roads Clark Gable and Claudette Colbert travel. Post-apocalyptic movies are all the rage now --- who knew they did one in 1934? This is our lives was maybe what patrons thought then, and could be that's what put them in seats by droves. Would It Happened One Night disquiet me less were I not so spoiled? Depressionists didn't just expect food, shelter, and overcoats the way we do now. 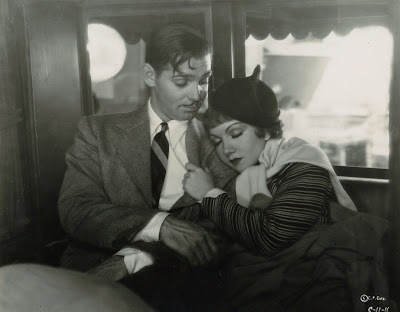 Life was struggle and there's no assurance Claudette will finish this bus ride intact, hers a perilous trip to Oz with Gable as sole protector. Everyone else traffics at thievery, extortion, and fortune hunting. Even a kid in tears over his mother's starvation comes across as maybe running a scam. You can go cynical quick on human nature watching It Happened One Night. Jolly Alan Hale gives the couple a lift, then steals off with their luggage, a second time that happens to Claudette's character. Gable takes after the guy, subdues him (offscreen), then reports back later of having tied the would-be rogue to a tree, to which I wonder what'll happen to immobilized Hale when the next band of road agents come along. At one point, Colbert unknowingly breaks line at a communal shower, incurring wrath of surly-at-the-least women I half expected to gang-whoop her. Transit life for all I know is more dangerous now than then, but what engaged me here was Capra's refusal to sugarcoat hardship of living minus a safety net. Busted Gable makes do with raw carrots off the ground and you figure it's not his first time. I wonder how many in 1934 who saw and loved It Happened One Night had known hunger in their own lives and were only recently endowed with means to buy a movie ticket. 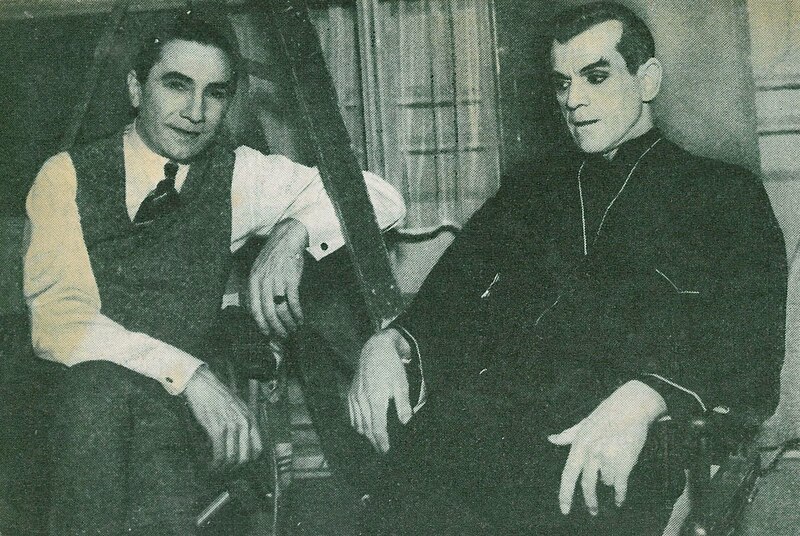 Something made it click to fantastic rentals, and I'd doubt that was mere Gable and Colbert Together For The First Time (as promoted in the fan magazine ad above). 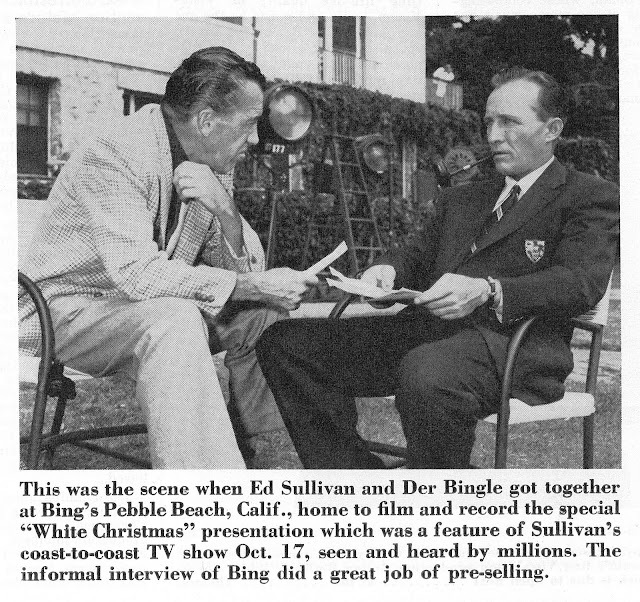 Don't know where, but I read David Selznick considered It Happened One Night the perfect blend for boxoffice, one he wished could have borne his name. Histories positioned IHON as little engine that could, up from poverty row and defeating odds to become sleeper of all time. Some of that I'd guess is true. 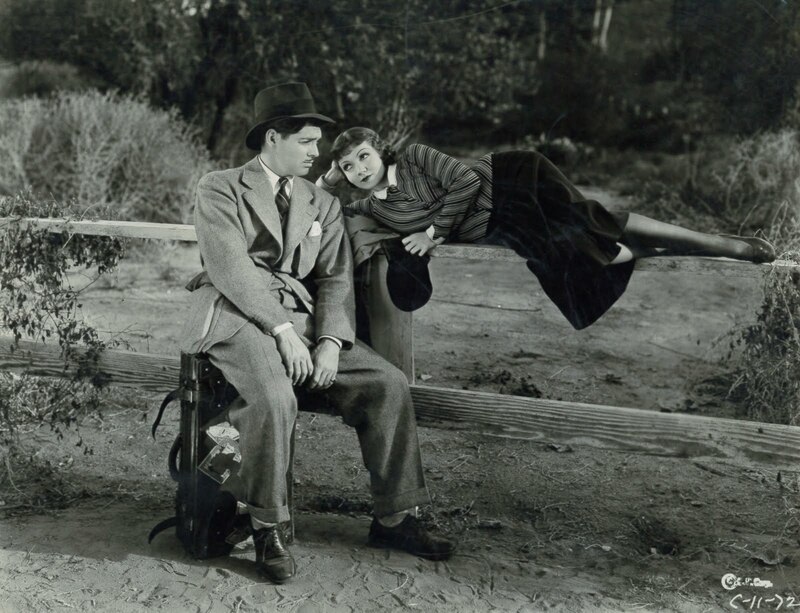 Frank Capra would cast the film as underdog not unlike characters he developed for stories to come. 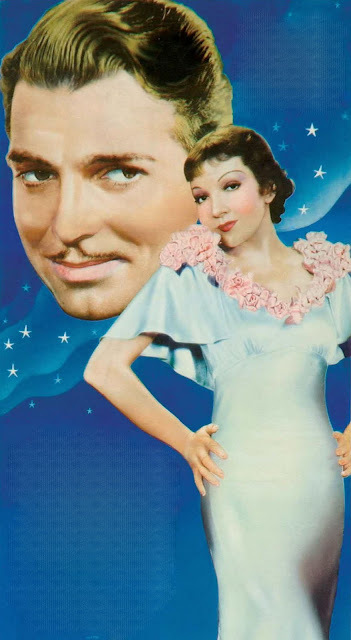 You almost wonder why he didn't make a movie about the making of It Happened One Night, so entrenched were legends within short time after perfect storm of its 1934 reception. Remember the part where ...? led off conversation that inspired second, third, whatever viewings. Theatres did better with It Happened One Night on repeat runs than most product on a first, it being among few comedies to engage a truly mass following. Was Capra's just perfect timing? Variety wondered why 1948's reissue booking delivered short for a Los Angeles circuit. Well ... life, roads, and romance saw change (a lot) in those fourteen years between, and maybe folks didn't want reminding of how austere things had all too recently been. 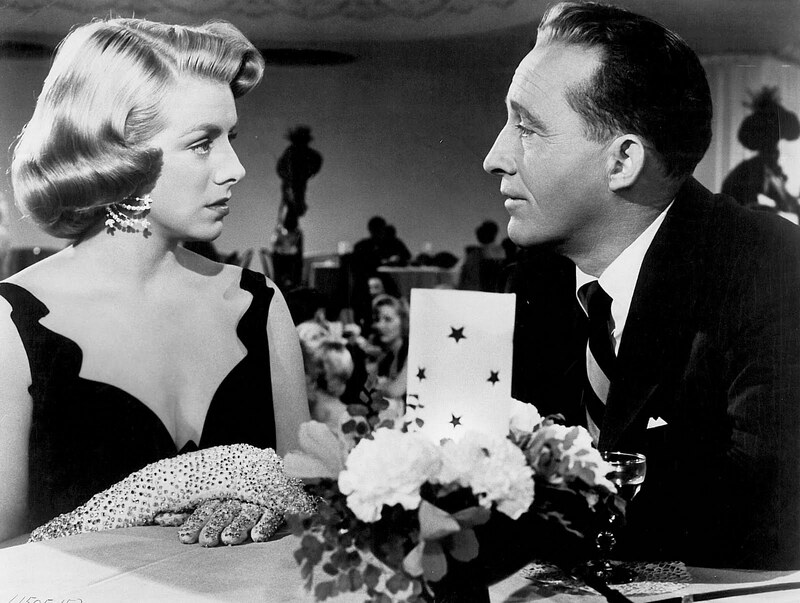 Documentaries about Hollywood weren't complete without excerpts of It Happened One Night. Those walls of Jericho bespoke movies as they'd been and wouldn't be again. Gable and Colbert hitch-hiking encapsulates what Classic Era stars and story-tellers did best ... proof that an industry wasn't making movies like it used to. 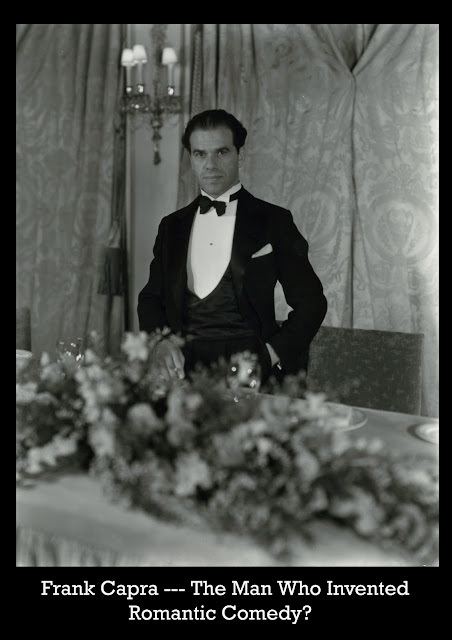 Such ease of perfection loomed over Frank Capra as well --- why couldn't he do them so well anymore? It Happened One Night, with ducks in a row five minutes past titles, was economical like this director's silent comedies had been. Gable and Colbert vehicles to come were evidence that such quality was had once in a hundred. Part of the freshness came of their acts being not so ossified in 1934. 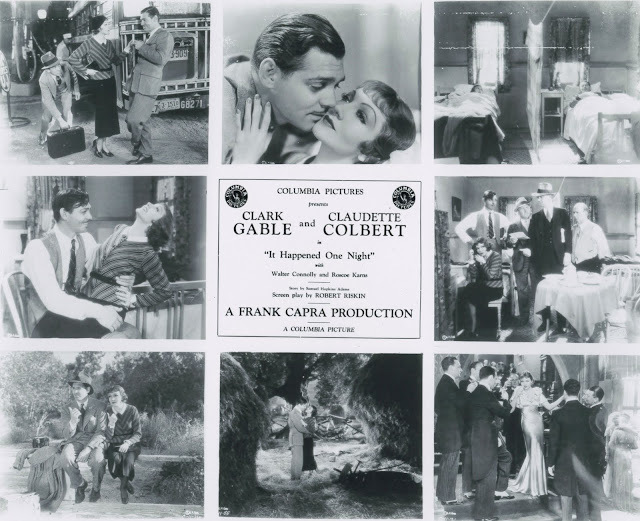 Both major names, neither Gable nor Colbert were yet crated with fixed image that would make later work more predictable. Watch their reunion in 1940's Boom Town and note mannerism, tricks, and gesturing clearly sops to fan expectation. Is it a wonder stars got bored being stars? For It Happened One Night at least, there was fun of personas still developing. 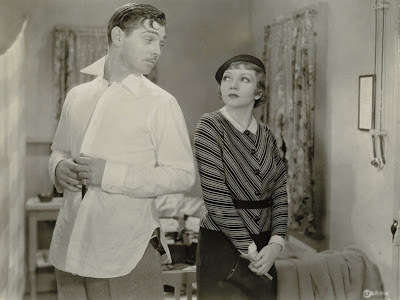 Gable doffing clothes to reveal no undershirt was image-defining he (and Metro) would trade on long after this kind of spontaneity got corporate-scrubbed off his plate. 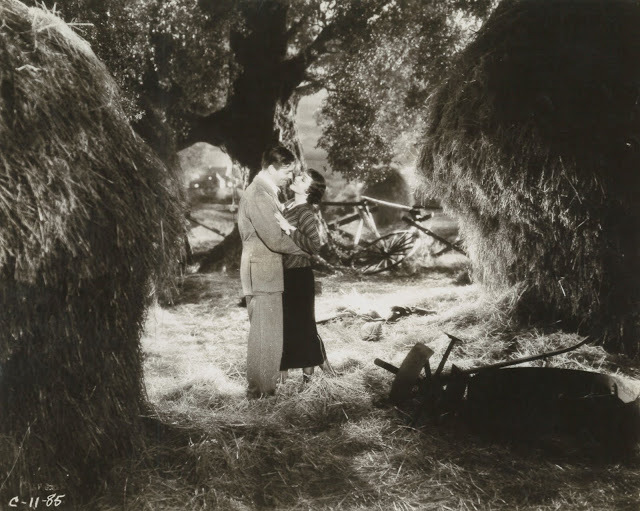 I'd give Frank Capra credit for inventing romantic comedies as we've known them for a past seventy-six years. Was there anything prior to 1934 you'd call a precursor? Not among pics I've seen. 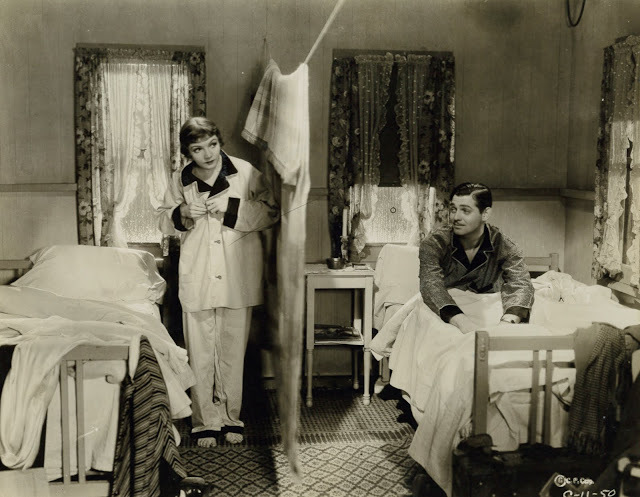 Prior (talking) battle-of-gender comedies play more raffish and precode. 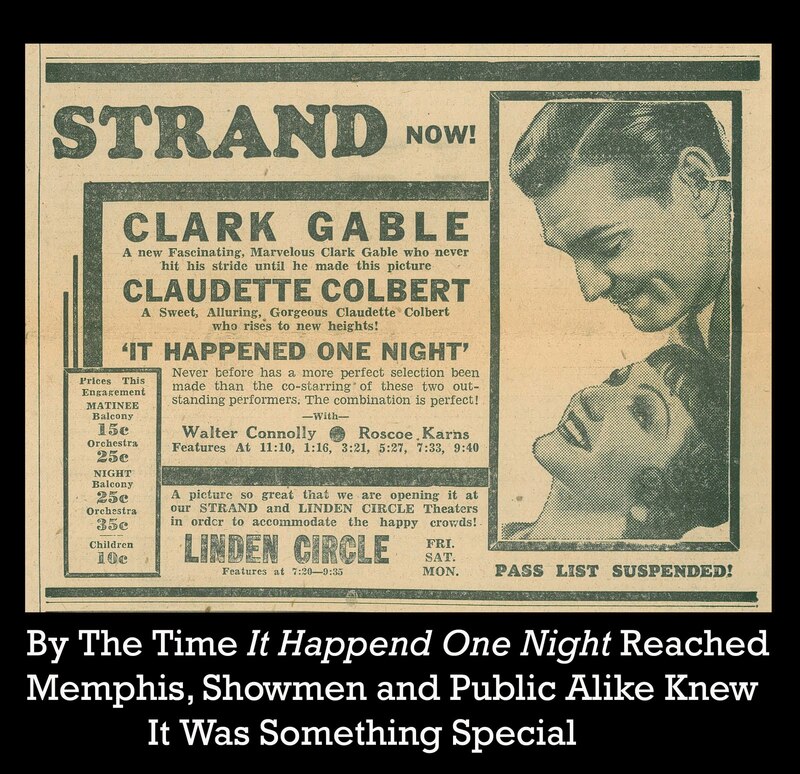 It Happened One Night got under wire of strict enforcement too, but doesn't really speak in pre-coded terms (could there have been trims made to the negative for subsequent releases?). I wonder if writers of Kate Hudson and Jennifer Aniston rom-coms have watched It Happened One Night. Certainly they know the blueprint, having doubtless looked at numerous other shows that imitated Capra's original. Is it safe to say that all romance comedies are six (more or less) degrees removed from It Happened One Night? My own uneasy response notwithstanding, I'd think civilians would enjoy IHON as much as any 30's sampling, possibly more for having seen its devices reused right up to present day. 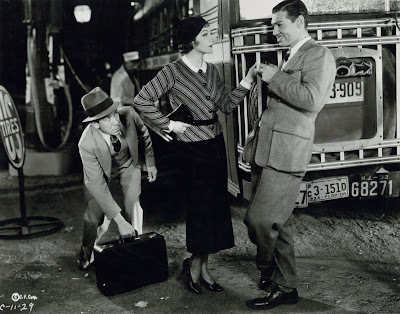 Frank Capra would travel with It Happened One Night till nearly an end. One early eighties revival he attended at the long-shuttered Capri Theatre in Charlotte found management presenting a 35mm print that looked like a third-generation dupe, for which Capra apologized profusely. This was not the movie I made, said the director to an audience stilled by disappointment. Greenbriar has been up 710 times since December 27, 2005. I wouldn't have thought there'd be that much to talk about. Health permitting, 710 more should come down the line, for maybe surprisingly, I've not burned out on GPS yet. Heaviest Greenbriar traffic tends toward the archive. That's a separate site with links, index, and search options that's a lot handier than archive and search features provided by Google/Blogger. Click on a past month at the bottom of this page, for instance, and you'll only get half or so of the posts that went up that month, a bugaboo I have not means of correcting. There is a page at Greenbriar Archives that lists every post by date with links to all. That's the surest place to find whatever's wanted, in addition to the names and titles index. EC COMIX FOR DUCATS: Let's call this a portrait of kids trading hundred dollar bills for admission to wily Warren "Bud" Patton's playhouse back in 1954. 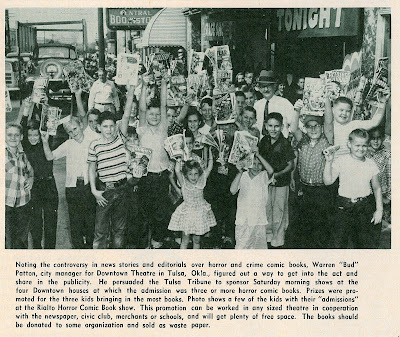 Read the caption and imagine what these comic books would be worth today. Did Bud really sell them for waste paper or have heirs cashed in on fantastically accelerated value of EC horror mags since? The idea of this civic-minded promotion was to liberate youth from mind-rotting Vaults of Horror thought to be leading a generation down perdition's tunnel. 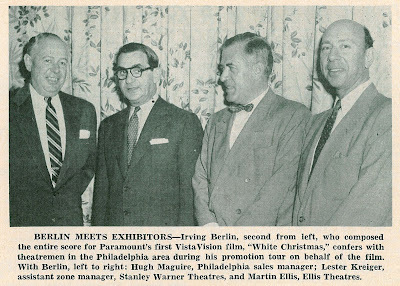 These comics were, after all, far more explicit than content you could put on '54 screens, so maybe exhibs like Bud wanted much as anything to rid themselves of published incubi and put moppets back in theatre seats for spook subsidy. Patton's Tulsa, Oklahoma scheme was tried elsewhere, and in fact, backfired Miami-ways where small fry queued up to swap over 8,000 horror comics for theatre admission and so-called "approved" mags which were distributed with tickets. Trouble was the promotion actually stimulated interest among Miami's young in shock graphics once they got ganders at contraband gathered for the drive (Miami had an ordinance forbidding sale of chill and crime comics to anyone under seventeen years of age). 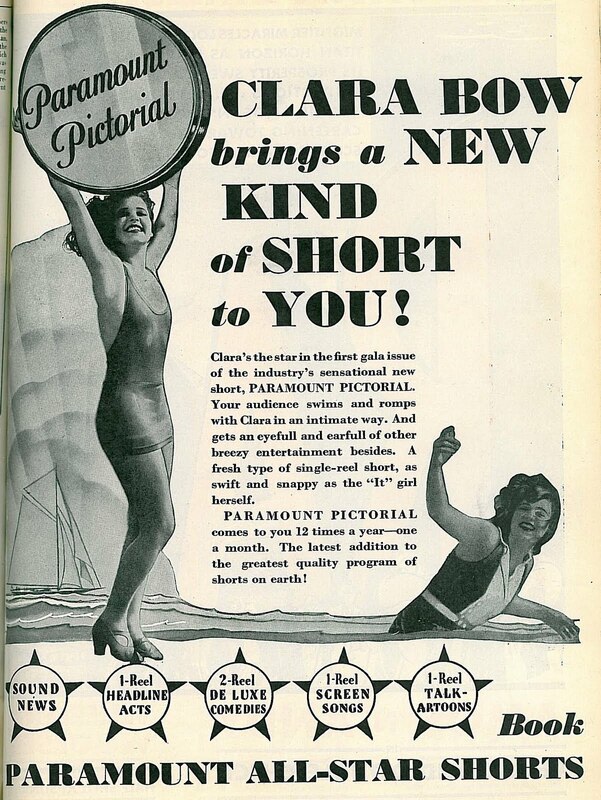 CLARA ON THE BEACH: Someone better informed re Clara Bow needs to clue me on wherefores (and whereabouts) behind this Paramount Pictorial short. 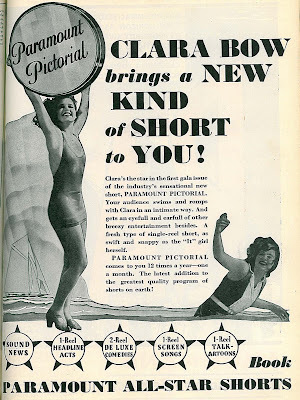 Your audience swims and romps with Clara in an intimate way ... now does this have possibilities or what? So many single-reel subjects wait to be unearthed. I've spoken to no one who's come across the treasure referenced in this 1930 trade ad. Maybe it's buried in same sand Clara romped upon. 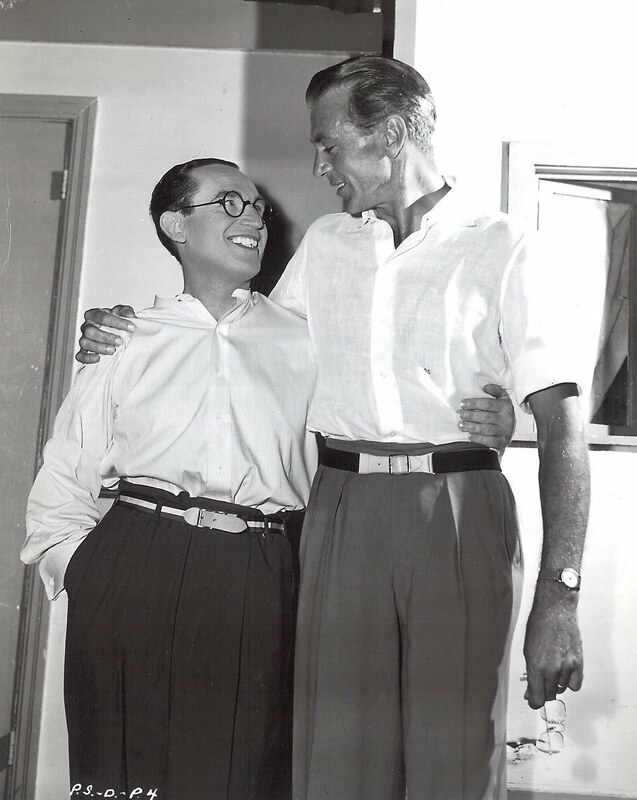 HAROLD LLOYD with GARY COOPER: This was taken at Paramount in the early thirties. Note Cooper holding eyeglasses ... Harold wears fake ones and Coop needs the real thing. I like those novel belts they're sporting. Why can't men's fashions today be remotely like this? Wonder if GC ever visited Greenacres. Assuming he did, it must have astounded Cooper how much money could be realized out of the picture business, though very few saw so much as to equal Harold Lloyd. GLIMPSE OF A SET: This one is a "spaghetti joint" as envisioned for The Roaring Twenties. Such a thing looks modest put against a sound stage corner. Remarkable how it comes to life in the final movie. I like the cars parked outside the windows. You could still fool people into thinking they shot this outdoors. 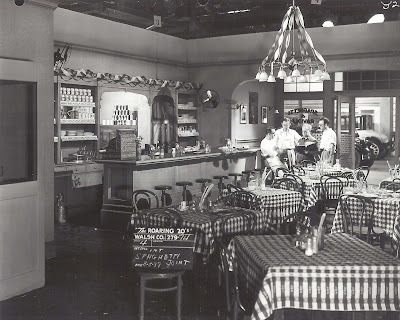 Warner pics were amazing for bringing exteriors inside. They even shot Sea Hawk ship battles in a sound stage tank. 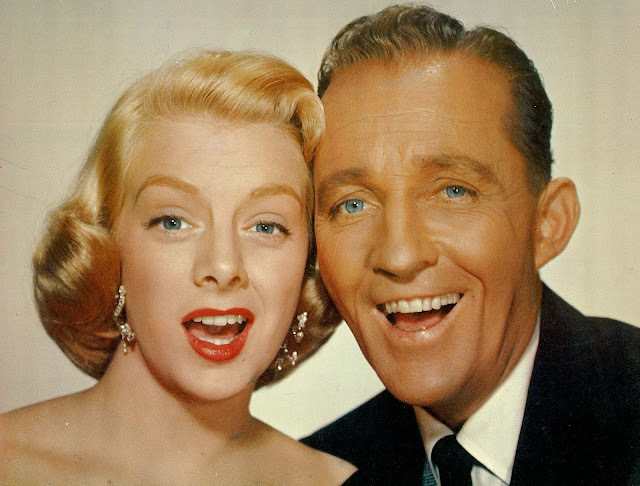 SNEEZIN' FOOLS: Celebrities were wisest who played to each other's strengths. Billy Gilbert's was a sneezing routine indelible as his signature. Gilbert would perform it to the end of a long life. 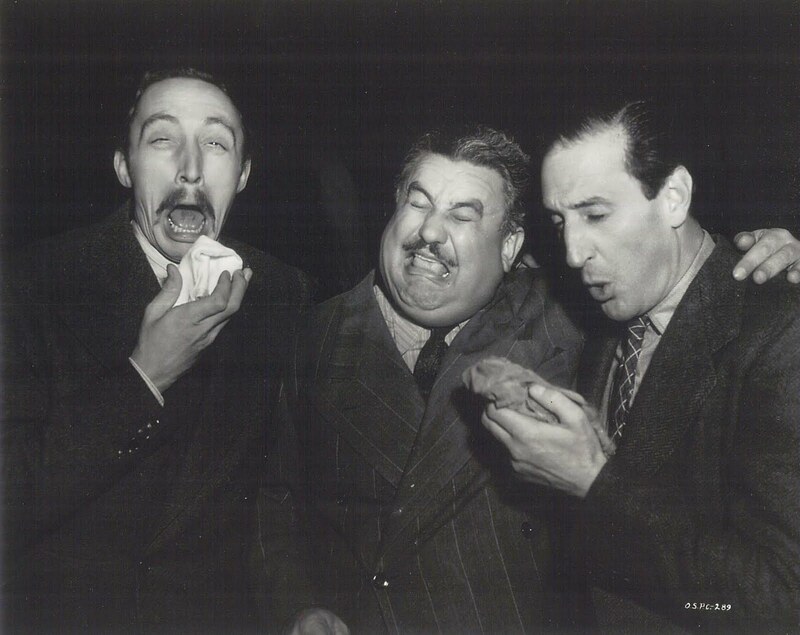 Here a late 30's Universal gathering with Mischa Auer and letting-hair-down Basil Rathbone, perhaps on break from Son Of Frankenstein doings. Would Basil have maybe preferred clowning to so much screen villainy? 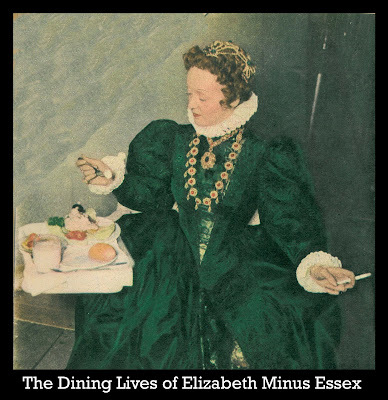 LUNCH IN COLOR: Looks like Bette Davis is having chicken salad with her cigarette between Elizabeth and Essex set-ups. I'll bet actual eating found a blanket-sized bib in the star's lap so as not to stain that period costume. How distracting was it to have still photographers trailing you to lunch? For work days like Davis put in, you'd think fuller course meals would be in order, but stars then as now lived on crumbs (and nicotine) so as to keep weight gain at bay. Given a choice between celebrity and food, which would you select? LEAVE HER TO FASHION: Here is Gene Tierney in another of those fab fotos in color out of fan mags that promoted she and newly arrived Leave Her To Heaven, a Fox 40's hit of cosmic proportion ($8.2 million in worldwide rentals --- Fox's biggest of that decade). Word-of-mouth was intense, especially for that scene where she let the kid drown. Truly a must-see picture in 1945, and probably better-remembered by its first-viewing generation than Laura. 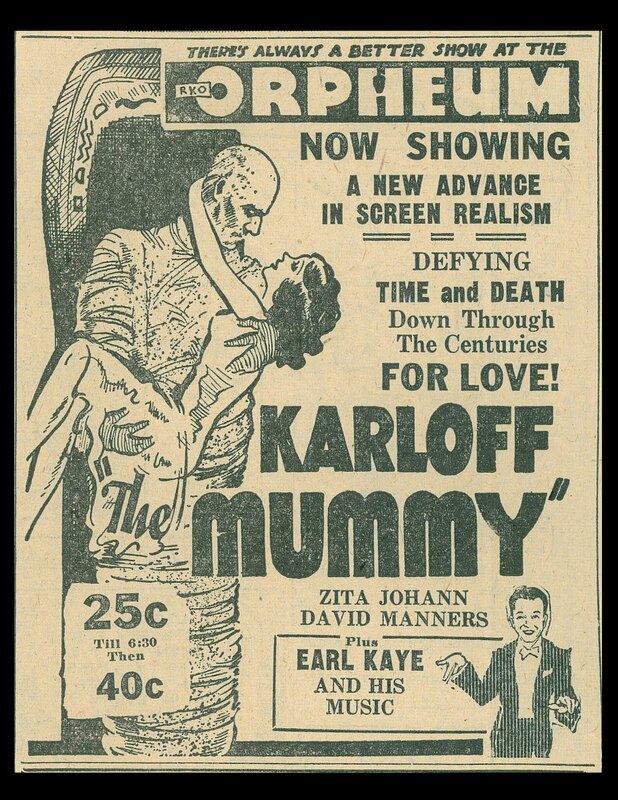 MUMMIES IN LOVE: Uh, I don't think this scene is in the picture ... but what a stopper it would have made! Selling in those days was pursued with whatever it took. 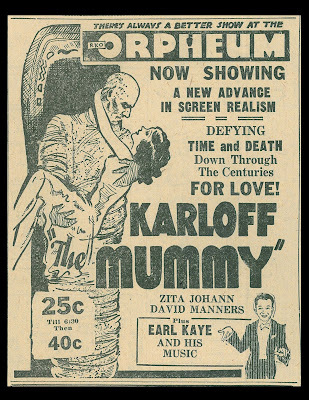 The mummy exiting his sarcophagus into the arms of ... just who is this gal? ... doubtless separated many a twenty-five, then forty cents, from patron purses. So what if the film was something else entirely? LOCAL PALACES: Finally, here is rare glimpse of our own Liberty and Allen Theatres, both referenced many times over five years of Greenbriar endeavor. 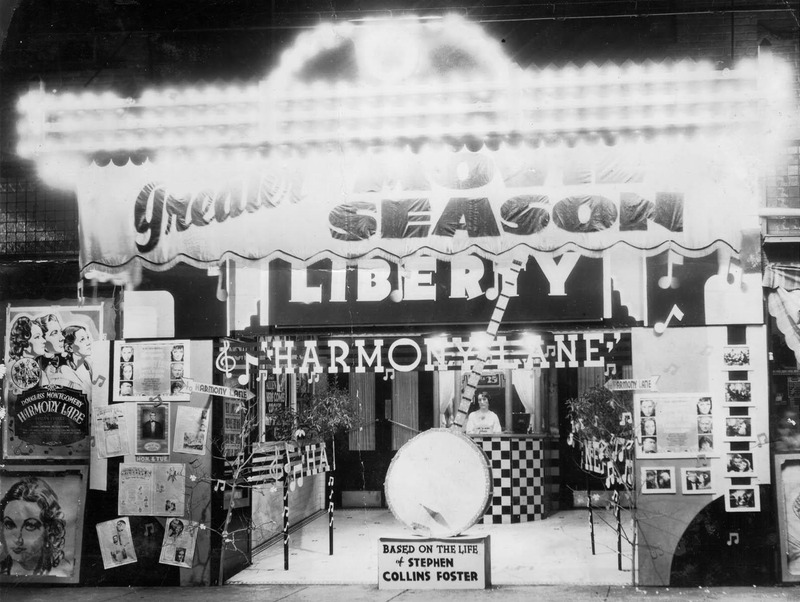 The Liberty is circa 1935, way before my time and unlike the Liberty I grew up attending. Among other things, its boxoffice was moved and the marquee replaced. The lady in the window looks almost like a wax figure you'd see in one of those arcade fortune-telling devices. For all I know, however, she might be kin to me. The Allen is a snapshot one of Ann's friends recently came up with. Could you pick a better attraction for that marquee? 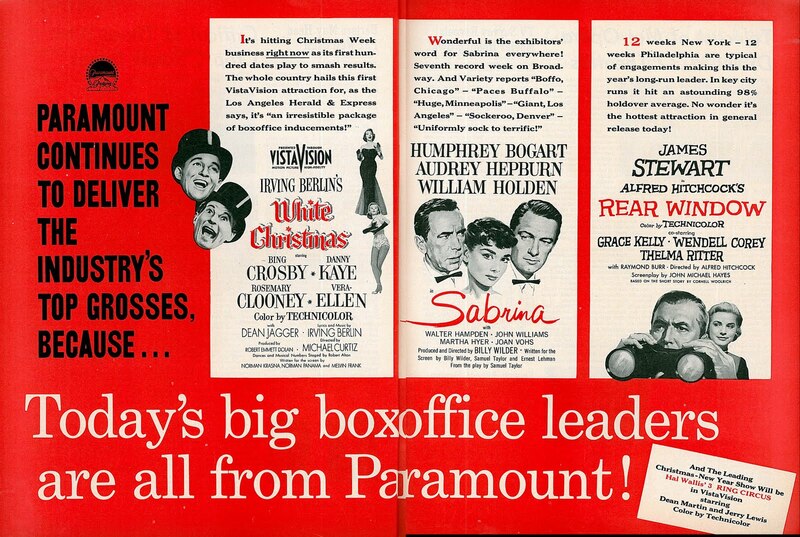 And how many small town venues put Howard Hawks' name among featured lettering? Yes, he was somebody to average patrons long before auteurists (think they) discovered him. 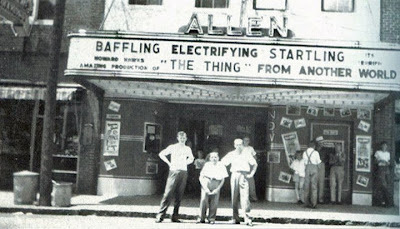 The building is still there with four upper windows intact, but alas, no more Allen. 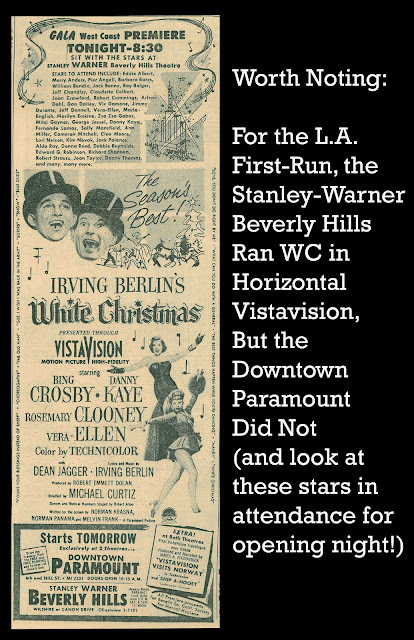 Paramount's pre-releasing was the Grinch stalking White Christmas so far as down-the-line exhibitors were concerned. As was mostly case in days before mass saturation openings, 'twas urban palaces feasting first, with small situations left to patron questions as to why they couldn't unwrap White Christmas until ... after Christmas. 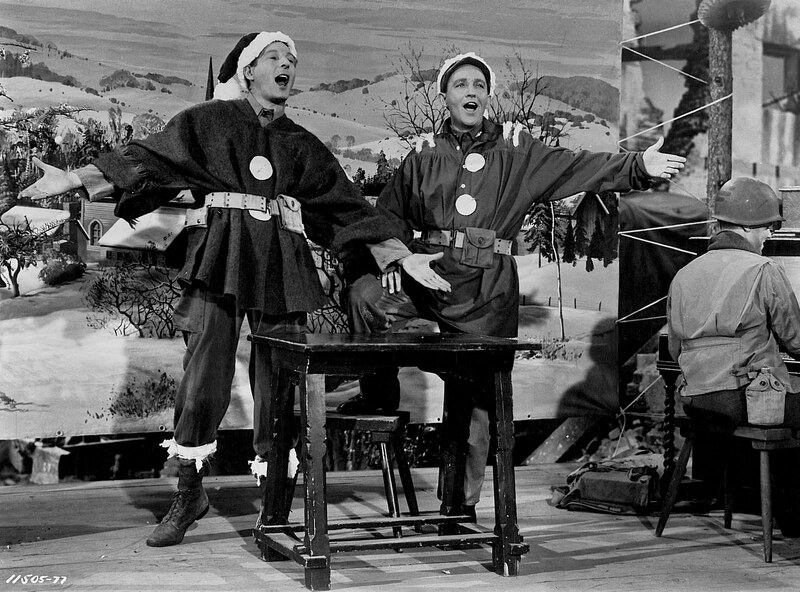 City dwellers got favorable treatment accustomed them, while outlanders dreaming of a WC drove (sometimes a hundred or more) miles to Bing's holiday caroling. 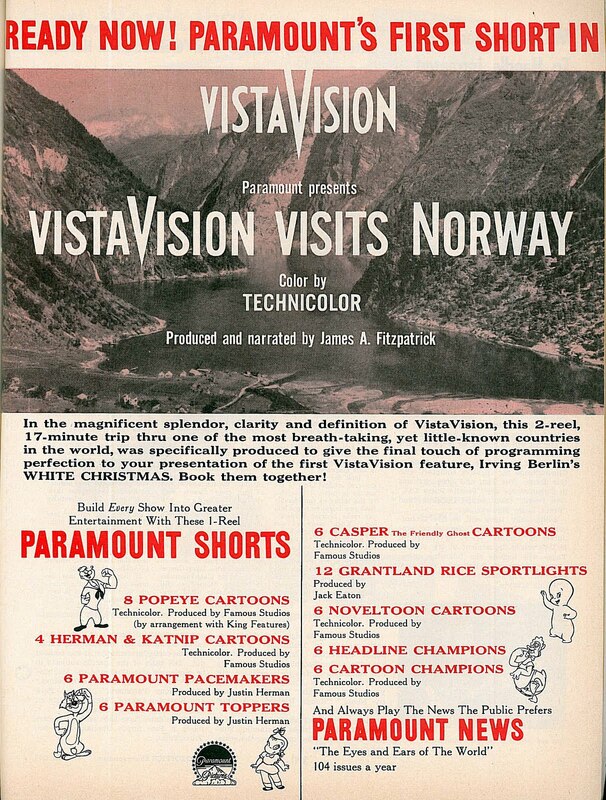 Added to Paramount's pre-release stocking was a short subject, Vistavision Visits Norway, a fiords tour familiar-voiced by James A. Fitzpatrick, veteran purveyor of travelogues who'd never had it so VV-vivid as this. 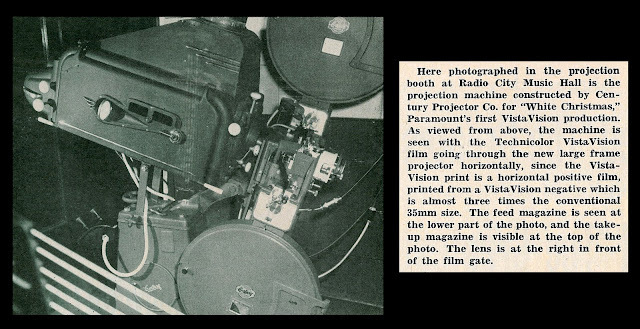 Sights gasp-inducing in '54 first-run were only hinted in a 16mm print I watched yesterday (despite IB Technicolor), so imagination had to conjure glories they knew on mega-screens. 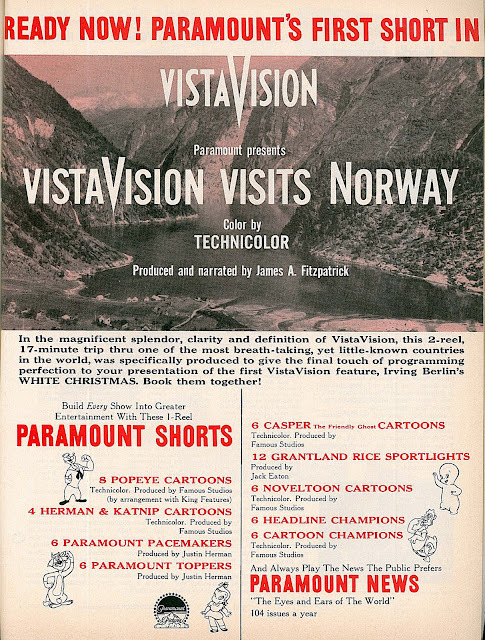 Shipping Vistavision Visits Norway to all pre-release venues would settle any doubt of VV being a visual force to reckon with, and Paramount would continue issuing horizontal travel folders for a show season to come. 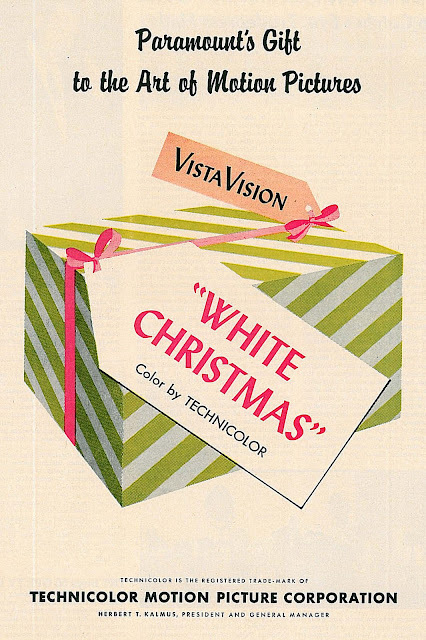 Urgency to get White Christmas into theatres before or concurrent with Yule calendars saw Technicolor performing lab heroics to generate a record 450 prints by mid-November, which is unusually high, said Variety, but hey, so was demand for White Christmas, a See-It-Now attraction if Paramount ever had one. 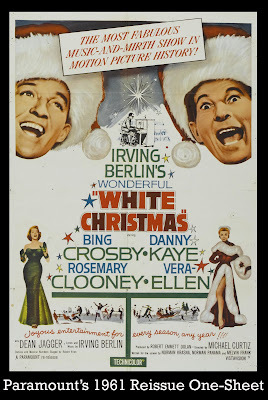 Boxoffice awarded its Blue Ribbon to White Christmas, not unexpected for bushels of cash plowed. As of December 11 week, WC rang holiday registers loudest, averaging 270 percent of normal business in nineteen cities first-running it. 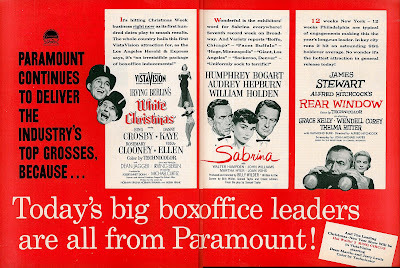 Paramount's season tree was ornamented with Sabrina and Rear Window as well, either of which could dominate a less fulsome field. 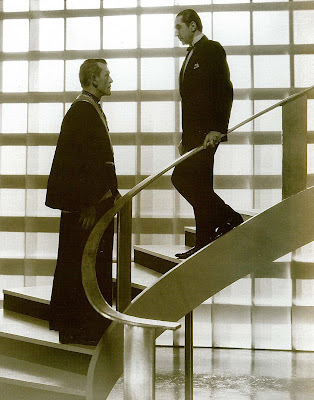 Hitchcock's show had been delayed owing to Para's deal with James Stewart not to muscle into The Glenn Miller Story's mid-54 window. 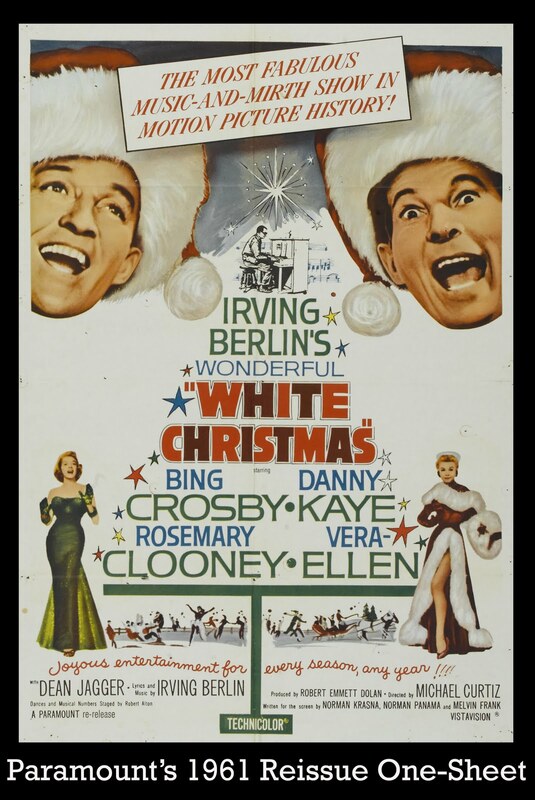 Special permission was obtained from Danny Kaye to release White Christmas mere months behind his Knock On Wood, also for Paramount. Even biggest stars were acutely sensitive to crowding themselves marquee-wise. 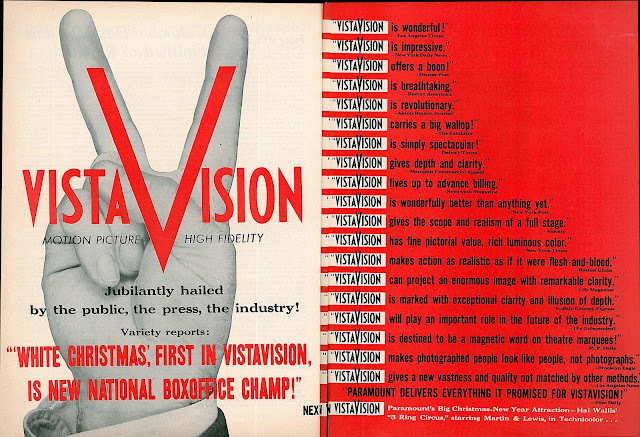 White Christmas tie-inning meanwhile represented industry of its own. There was money in this music even without a movie to propel same, for artists like Crosby and Rosemary Clooney needed not screens to abet Hit-Parading. Eighteen million recordings of the title tune, eight million of these Crosby's version, were already in circulation. 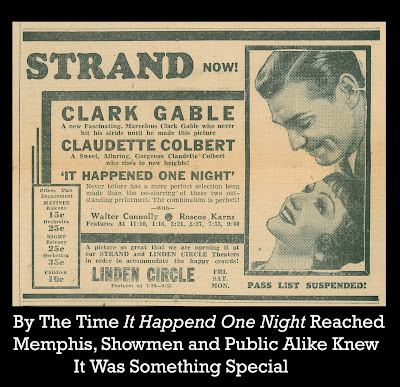 Sheet music sales stood at three and a half million. Needless to say, these achieved records. 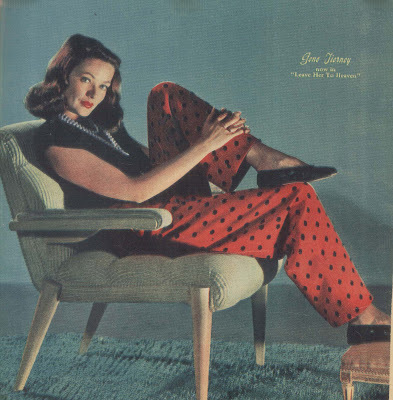 Nine new songs looked to similar reception, of which one, Count Your Blessings Instead Of Sheep, led charts (President Eisenhower got in the act here by mention of Eddie Fisher's rendition during a nationwide broadcast). Sisters and Love, You Didn't Do Right By Me rode coattails to airplay, but where was likelihood juke-heads would embrace What Can You Do With a General? 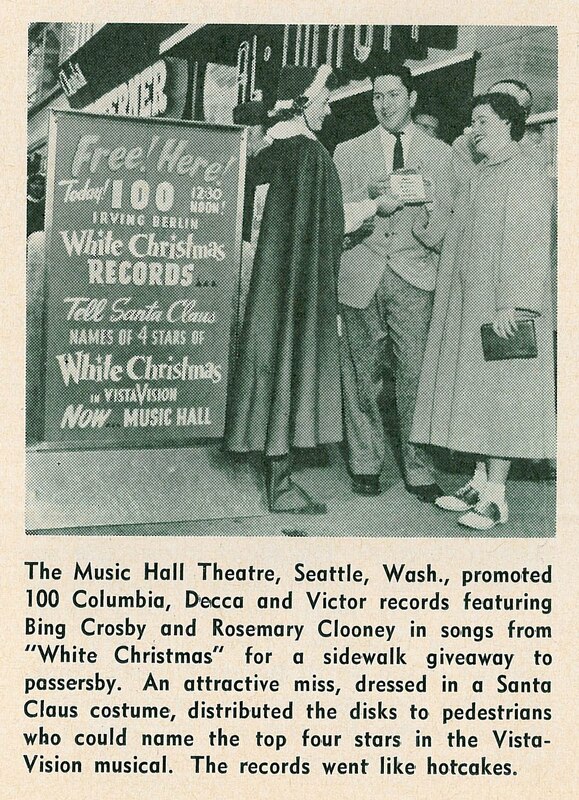 Crosby and Clooney both got out new Christmas albums --- it would have been folly not to. 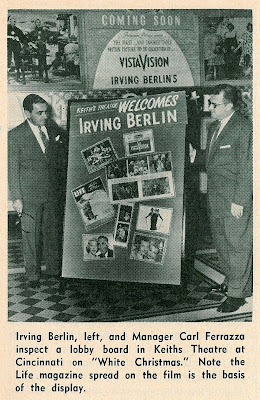 Irving Berlin was all over maps on the pic's behalf. Exhibs, record store owners, disc jockeys must have figured they were dreaming to host such a legend. 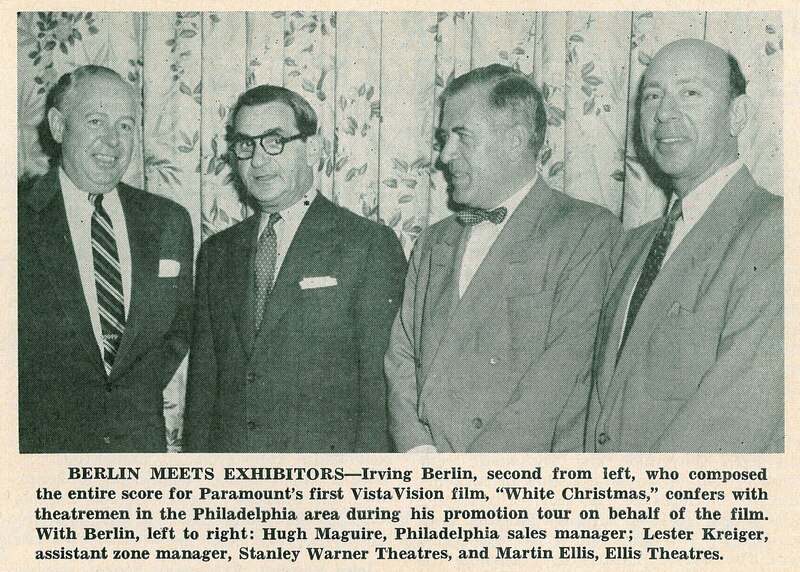 Tunesmiths came and went, but everyone knew Berlin for having been (and continuing to be) maestro of them all. 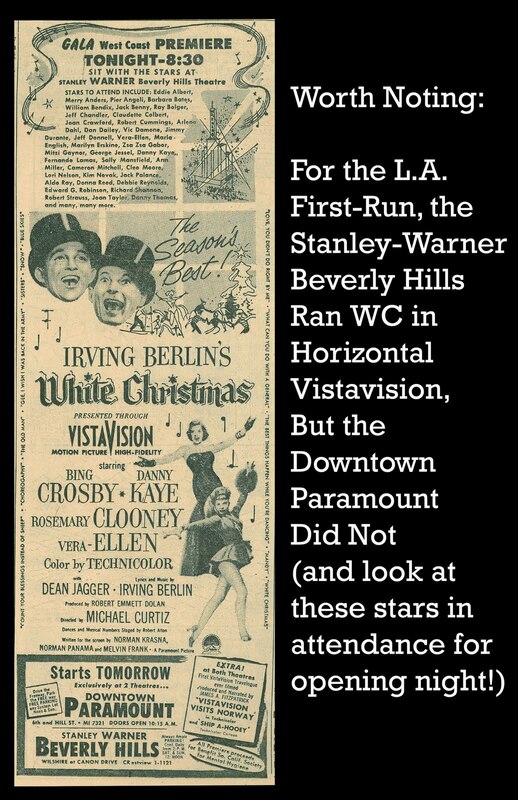 Obviously, these were dollars everyone wanted in on, though with $3.75 million spent on WC's negative, Paramount looked toward celebrating first. 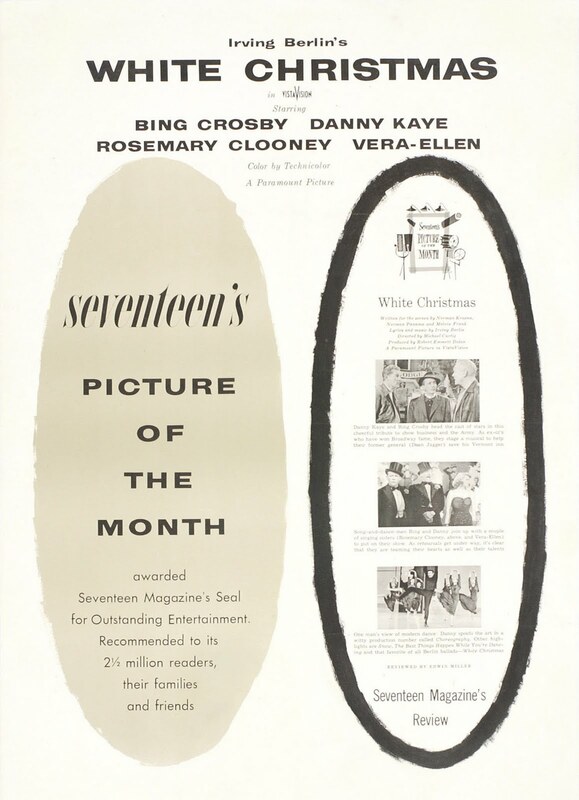 Biggest returns had come through Radio City's play, its contracted (and maximum) eight weeks concluding in early December (MGM's Deep In My Heart was slotted for the Hall's year-end holiday program beginning the 8th). White Christmas widened past a thousand dates during crucial run-up to December 25. It didn't take genius to recognize these were best weeks for harvesting coin. But what of showmen not among said thousand chosen? Our Liberty was but one (of many) unspooling White Christmas whilst snows melted and flowers bloomed. 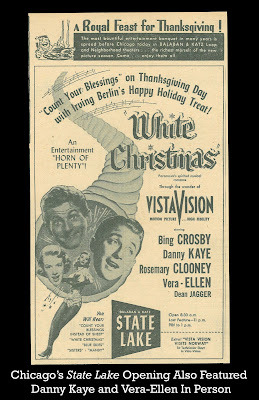 Independent showmen resented hell out of freeze-outs plus ruthless and confiscatory terms on White Christmas. One called distributors octopi sucking blood out of the exhibitor system. Cited for the most insatiable lust for blood and strongest tentacles was Paramount. Being left crumbs of late WC booking stung exhibition worst. One manager's February 1955 letter to Harrison's Reports reported 30 to 40% drops for White Christmas in his territory after holidays passed. Minneapolis houses feuding with Paramount since October '54 had led to boycotts of the company's product. 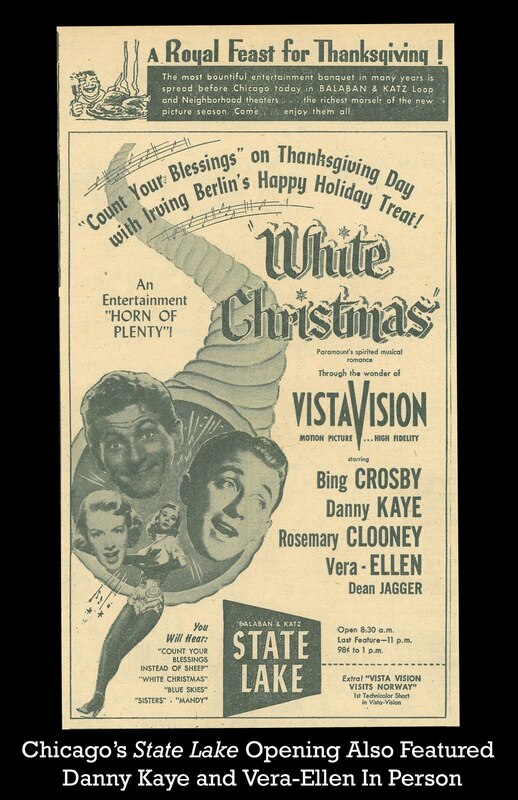 Said squall kept White Christmas off screens there until February 1955, late indeed but for patrons nostalgic for Yule-times two months past. So who got richest off White Christmas? There were five hundred bookings designated as pre-release at 70/30 rate. These yielded $4.6 million in domestic rentals. General release, with 13,306 bookings, realized an additional $3.5 million. 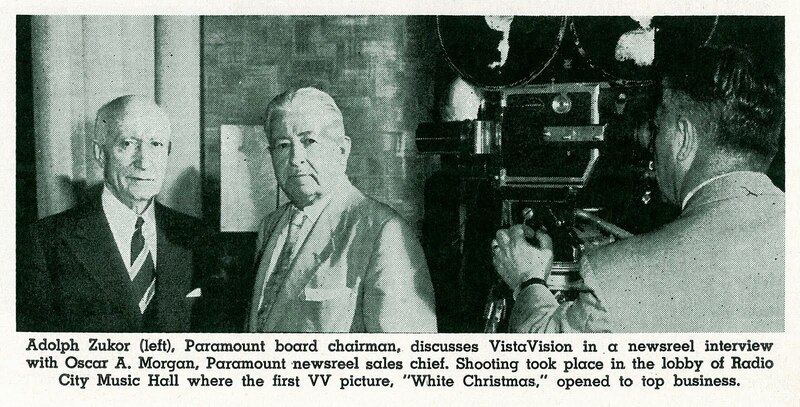 Variety took stock in August 1955 and listed paydays: Paramount's end of the profits was thirty percent. 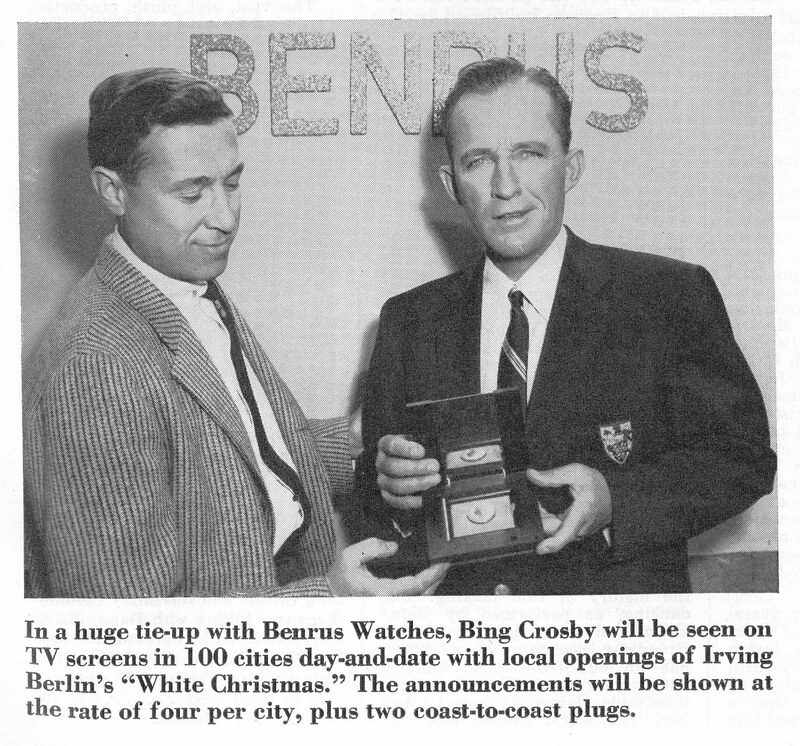 Bing Crosby got thirty percent plus $150,000 he'd collected to star. 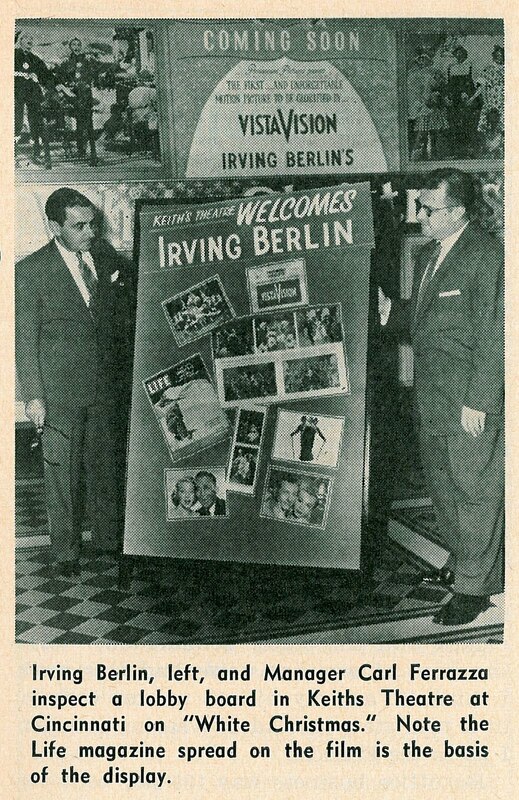 Irving Berlin received 30% along with $250,000 for the score (his reported net from the film was $1.3 million). 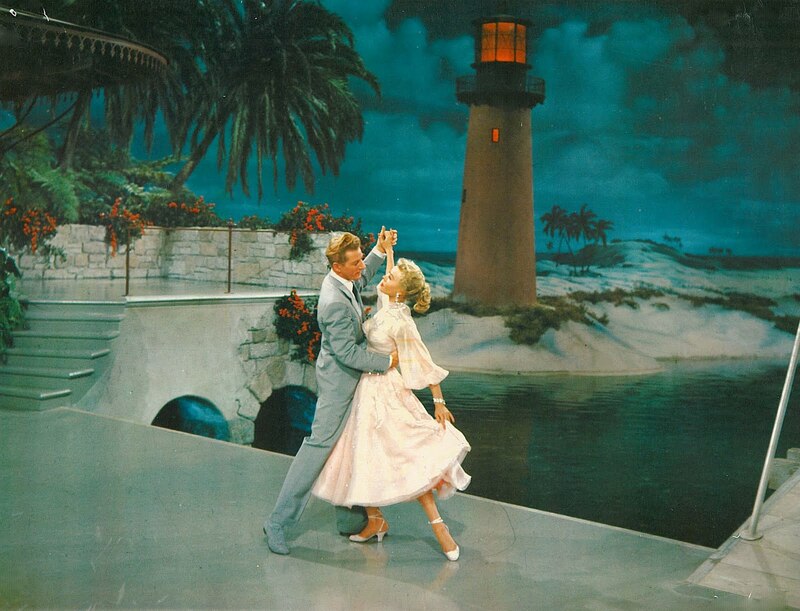 Danny Kaye's share was 10% along with $200,000 taken after Donald O'Connor's drop-out. Director Michael Curtiz was paid a flat fee and no percentage. 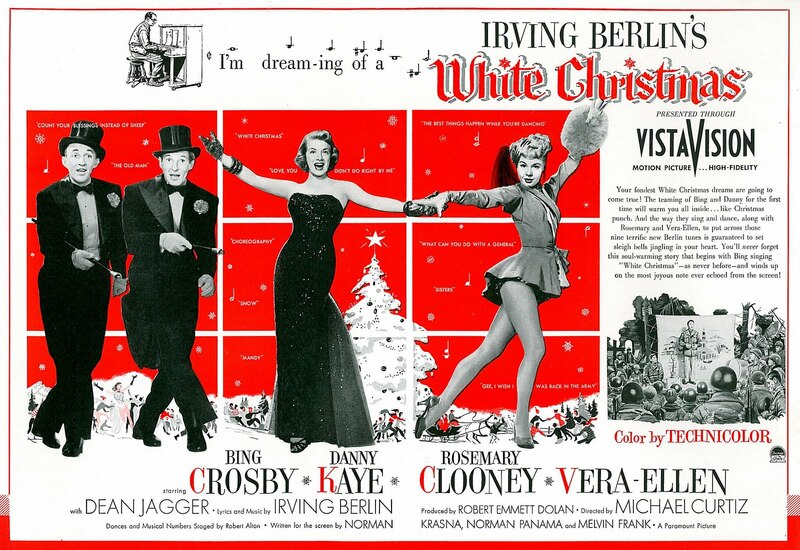 It was expected that White Christmas would end up with $18-20 million worldwide. These numbers were, of course, adjusted upward as the picture continued selling. 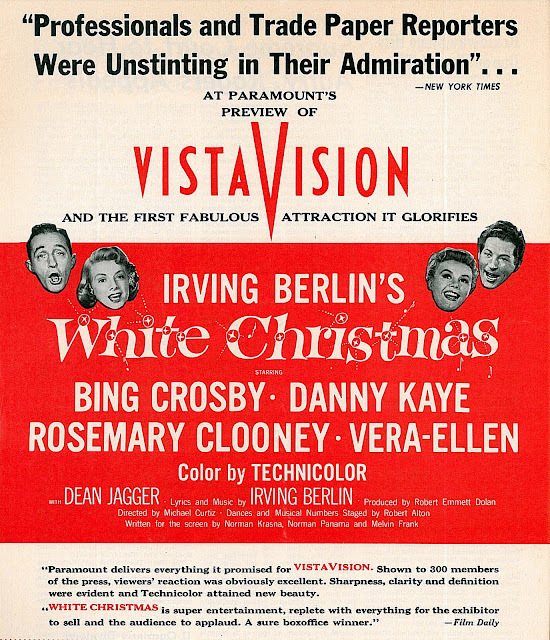 Paramount withdrew White Christmas in June 1955, keeping it in abeyance for a second go that November-December, at which time it was designated the company's 1955 holiday release (as reported in Variety, although reader Mike Cline reports a booking he found for August '55 in Salisbury, NC). A 1961 reissue, with all-new paper, trailers, etc., brought another $635,000 into tills. Paramount leased White Christmas to NBC for two runs, the first in December 1964 primetime. Neilson reported a whopper forty share from that debut telecast. The network sought additional runs and Paramount made them pay. 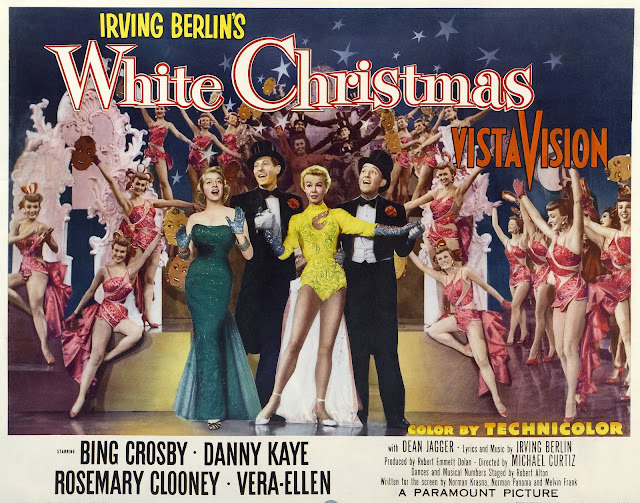 $500,000 was the tag for two further nights of White Christmas, an expense NBC duly passed along to advertisers. Shrieks along Madison Avenue greeted net demand of first-run prices (apx. $43,000 per minute) for a retread White Christmas plus two other Paramounts again in evening play, Stalag 17 and The Bridges at Toko-Ri, all three having proven themselves rating-wise (Stalag 17 passed even White Christmas with a forty-four share). 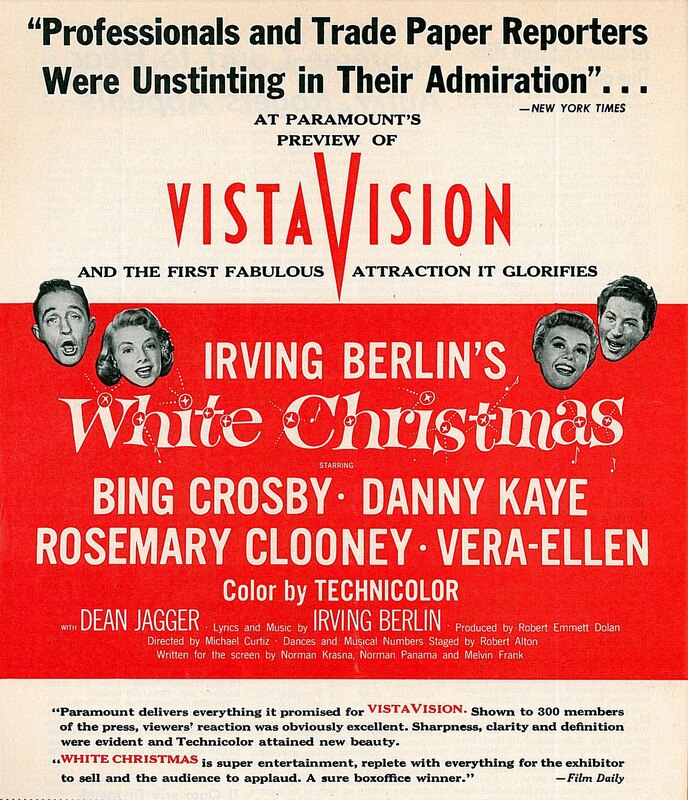 The rhubarb ended when NBC guaranteed the pics would perform in line with first-run viewer numbers, which White Christmas did and would continue doing for multiple runs to come, earning NBC's approving label as a holiday perennial.